Recent years has seen an increase in couples who choose Malta as the place for their wedding or civil union. In recent months too there has been an increase in Malta weddings for Indian couples, weddings funded by extravagant millionaire budgets. One of these took place between last Saturday and Monday in three different places, in St Julian’s, Mdina and Valletta funded by a budget of no less than €2 million. All those who on Monday ventured towards Castille or at the end of last week entered Mdina or visited Dragonara Point would probably have imagined they had stumbled on a film set filming an Indian film. However, these were not film sets but real scenes from probably the largest and most expensive wedding ever staged in Malta with a budget that all those involved in the enormous celebration of love and abundance estimated the whole cost to have been €2 million – that is 70 times larger than the average cost of Maltese weddings. As is the Indian custom, the larger the wedding ceremonies, the better the wedding. 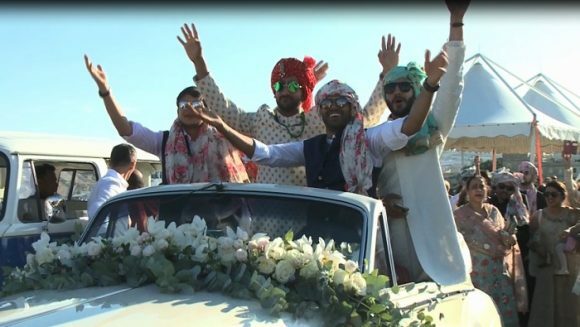 Following their two similar celebrations in India and Pakistan in the past weeks, the couple chose Malta to continue their celebrations of their glorious event, together with scores of guests who came to Malta purposely for the wedding. Celebrations were held over three days and included activities in four different localities. Two activities were held on Saturday, at noon and in the evening at a luxurious St Julian’s hotel. On Sunday the venue was Mdina Ditch with a generous dinner and an abundance of food using organic materials and herbs and spices, also providing massage services for the guests. On Monday, Budget Day, the scene switched to Valletta with Vjal Ġlormu Cassar leading to Castille Place being sealed off for some time for the start of the formal ceremony that brought together a couple from Pakistan and India, two countries that are traditionally enemies but show that love has no frontiers. The celebration continued with a dinner at the Upper Barrakka Gardens, a lavish reception with entertainment at the Saluting Battery. The whole event was organised by Maltese and Belgian entities and Alistair Fenech who was responsible for all the flower displays said that in a 21-year career in the industry he had never experienced anything on such a grand scale. He said over 20,000 flowers had been used as well as eucalyptus branches and twigs. The majority of flowers used were orchids number 8,000 as well as 4,000 roses. While the first two days embodied vivid colours mainly associated with Indian events, on the actual wedding day the Saluting Battery was inspired by romantic colours with clear and natural colours for flowers and other decorations. Despite the size and the grandeur, guests only numbered 350 and the weather played its part with three fine days enabling all to enjoy Malta’s charms. Alistair Fenech said the whole event was a show window for Malta and the view of the Grand Harbour was the highlight, providing the guests with a memorable and unforgettable experience. Civil union weddings in Malta are always on the increase. While in 2013 there were 634 ceremonies and last year 913 and many involved in this sector aspire to further increases, especially in Asian weddings as these provide a great boost to tourism, particularly when they are held in off-peak months.